To paraphrase a popular Zen koan, what is the sound of champagne corks not popping at Mitt Romney’s campaign headquarters? In a Fox and Friends Exclusive, former GOP hopeful Tim Pawlenty (R-Mn) has officially endorsed Mitt Romney‘s presidential bid, which could be the clearest case of subtraction by addition since the first time someone put Miracle Whip on a sandwich. To the extent that anyone noticed Pawlenty’s campaign, it was for his attack on Romney over health care, and his spectacular failure to say it to Romney’s face at a debate in June. That’s really a shame, though. We could probably light several cities with the energy those two would conserve. 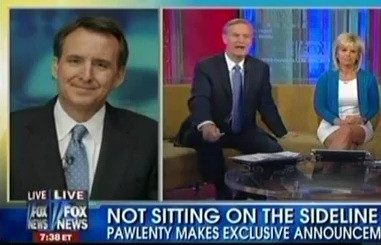 The real shame, though, is Tim Pawlenty’s flame-out. He was supposed to be the guy who could leverage the Romney/Huntsman “sanity” vote, while crossing over to appeal to social conservatives (and picking off a few Trekkies with his Vulcan-sounding nickname). Instead, he was unable to get either crowd to notice him, and Republicans can now only choose between a primary candidate who may be unelectable, and an electable candidate who probably can’t win the primaries. The media can share a decent helping of the blame here, as they not only focused on Pawlenty’s style over his substance, but they have also quickly shoved Michele Bachmann, Ron Paul, and everyone else overboard in their zeal to make this a two man race. It’s September, for crying out loud.